Home › Money Advice › Are you worried about making ends meet this side of Christmas? Are you worried about making ends meet this side of Christmas? 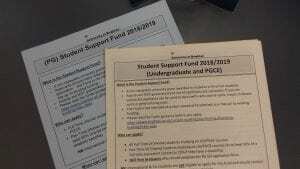 The university has additional funding available for students who find themselves in financial difficulty. The main fund is called the Student Support Fund and we typically receive in the region of 1000 applications throughout the academic year. If you are having financial problems and you want to apply, please read the guidance beforehand. If you have any questions about eligibility or the application process, please contact the Funds Assessors or Student Advisers 01273 642888. If you submit a complete application with all of the required evidence by 5pm on Monday 26th November 2018 and you are subsequently made an award, we will guarantee payment on or before Friday 21st December 2018. If you apply after Monday 26th November, we will process your application as quickly as possible but you may not be assessed until the new year. As the university will be closed between 24th December – 1st January there will be no applications processed during this time. Payments are made direct into your nominated bank account, using the details you have entered on student central. The award is not a loan, it is non-repayable.